I’ll never forget sitting in Carl Edwards’ retirement press conference in 2017 when he was trying to explain to a baffled room why he’d walk away from a perfectly good job into an unknown future. “There’s no life raft I’m jumping onto — I’m just jumping,” he said. That hit me hard, because I had started to tell my media friends the same day that I was soon going to quit USA Today and start an independent website funded through Patreon. I related to Edwards in a major way, because at the time, hardly anyone even knew what Patreon was. It was a terrifying leap of faith — a trust in strangers who follow me on Twitter — and I found out later my friends were quite worried about my decision! It was two years ago today when I actually launched the site. I can remember practically being sick to my stomach, because I knew the next few hours would reveal whether it could work or not. If it didn’t succeed, I was going to be out of journalism. It was this or bust. But if it worked, it had potential to be the most enjoyable job I’ve ever had. As it turned out, the past two years have been the best of my life. I’m so incredibly grateful to those who have chosen to support this website and podcast and keep sending me to the racetrack. It probably gets repetitive to hear me say THANK YOU all the time, but that’s honestly how I feel every day, so I can’t help but constantly be appreciative. That said, I often get asked: How long are you going to do this? And also: If another outlet approached you with an offer, would you quit Patreon? I can’t predict the future, but as of now, my plan is to keep doing this as long as you’ll have me. I’ve actually had some great offers over the past couple years and thought about those possibilities. But ultimately, I feel such a strong bond with those who have gotten me to this point — and I’m having so much fun doing it — that I feel it would be a mistake to change course. Patreon has given me the freedom to cover what I want, how I want, when I want — and for who I want. And that connection to my “bosses,” as I call them, is something I really cherish. I’ll give you an example. During a Southern 500 watch party here in Portland last September — a barbecue with some patrons who attended the Portland Grand Prix earlier that day — I was given a major shock. A group of my patrons had secretly raised more than $6,000 for my baby daughter Liliana’s education fund (which didn’t exist yet!) — and presented me with an oversized check! “Speechless” doesn’t even begin to describe how I felt. And that wasn’t even the only time the group of “Gluckers” (the nickname they gave themselves) had conspired to do something generous for me and my wife, Sarah. As you can imagine, things like that are deeply humbling. I certainly don’t think I deserve ANY of this and I constantly wonder why people have decided to be so supportive — through Patreon and beyond. I truly don’t get it, if we’re being frank. But it certainly makes me want to work harder and stick with this, because I view my role as trying to help entertain and inform people about their favorite sport. If they feel that’s being accomplished, then I’m not about to abandon it. Anyway, today is the start of Year 3, and I can’t wait to see what’s next. I’d be remiss if I didn’t take this opportunity to post the link to Patreon if you’re interested in signing up for the first time. This year I’m offering a few more patron-only pieces of content, so you can check out the details there. Plus I had 1,000 stickers made with my cartoon face on them, and if you become a patron by the Daytona 500, I’ll send one your way. Here’s how you can help support this website and my podcast (and get a sticker!). Thanks for reading — whether you’re a patron or not — and I’ll talk to you soon. One year ago today was one of the scariest days of my life — and also one of the best. I remember my heart practically pounding out of my chest that morning as I got ready to launch my Patreon page and let everyone know about the crazy idea to try and cover NASCAR for my own site. If you want to see how nervous I was in the time leading up to the launch, you can read this letter I wrote to myself early last year. The scary part about this day in 2017 wasn’t whether I’d end up getting enough money to cover 31 races last year (I still can’t believe that happened! ); it was wondering whether I’d get enough to eat and pay rent. I’m so nervous, my hands are shaking. OK, let’s do this. It might seem surprising/crazy/borderline insane to leave a great job voluntarily, but that’s what I did. Ultimately, it came down to this: USA Today needs a NASCAR writer in Charlotte, but I might not live in Charlotte for much longer. My wife, Sarah, is trying to become a Child Life Specialist (someone who works in a children’s hospital and helps sick kids and their families). She’s currently doing an internship in New Mexico, and she’ll be able to look for jobs after she’s finished in May. It’s a no-brainer for me to support her career and I need to have the flexibility to relocate, because who knows where we’ll end up? Well, Sarah did become a Child Life Specialist! And it did require that we relocate — all the way to Portland! Moving to Oregon definitely wasn’t on my radar, I can promise you that. I’ll be honest: This is the scariest thing I’ve ever done — I gave up a solid income, health insurance, travel budget, etc. — but it’s also the most exciting. I’m totally comfortable with the decision and it would be an absolute dream to make a living while remaining independent. I don’t know if this will work, but I guess we’ll all find out at the same time! The nervous part was always going to be the waiting and wondering whether it would work. I didn’t know what the response would be; it was impossible to predict. Fortunately, I didn’t have to wait too long after the launch. If you look above, that first tweet was sent at 11:01. Well, the first pledge — a $2 per month pledge from a guy named Mark Holthaus — came across at 11:03. Two minutes! That seemed like a good sign. Hey, at least I’ll have $2 a month, I thought. But Mark was far from the only person to jump on board right away. A total of 283 patrons pledged on the FIRST DAY my Patreon page existed. That’s absolutely insane! I have just over 1,000 current patrons now, so to have that many sign up on Day 1? It was overwhelming and honestly pretty emotional, because I knew then that everything was going to be OK.
By the way, there are 133 people who are still patrons from that very first day. They stuck it out all year long and are still showing their support. I can’t even describe how much things like that mean to me. In the year since this whole thing started, I’ve constantly been reminded about how amazing people can be. I feel unbelievably lucky to have such a remarkable group of supporters who also serve as my “bosses” — it’s an affectionate term, but it’s also appropriate because I really do work for them. Honestly, I’ve already been the recipient of more generosity and kindness than anyone deserves in a lifetime, so I don’t know when all this luck will run out. I know it won’t be forever, so I’m enjoying it while it lasts. But since enough people have stuck around and continued to sign up, Year 2 starts today. And I’m more fired up and excited than ever. If you are interested in becoming one of my bosses, here is where you can find more information. On the last day of 2017, I asked you for tips about sticking to New Year’s Resolutions. I’m glad to take the advice for myself, because I always make resolutions but have a hard time sticking to them. A lot of you said your advice was to not make any resolutions — because then you can’t break them — and suggested if these goals were that important, they shouldn’t wait until New Year’s. But I’m a very deadline-oriented person, so I tend to put things off until there’s a reason. So that’s why the start of a new year seems like a good time to make some changes. There were a couple themes in your advice: Accountability is a big one, because telling others means you create some peer pressure to keep the goals alive. But also people said it’s important to structure the resolutions in a way to where if you don’t live up to one of them during a given week (like not having time to work out), you don’t just completely fall off the wagon and stop doing it altogether. So I’m going to give you my resolutions now — primarily to be accountable for them. I’m terrible about drinking water. When I’m at the track, I don’t want to constantly have to pee — so I don’t make an effort to drink water. I’m not in the habit. But I know it’s super important for good health, so I’ll give it another try. I’ve tried apps before that help you track it, but the goals are so lofty (100 ounces of water per day?!?) that I typically fail right away and then just give up. I just downloaded a new app and it lets you set your own goal. I put it at 75 ounces of water per day. That’s still a TON compared to what I usually drink, but it seems perhaps more doable than 100 — and maybe I will be able to have a better shot at keeping up with it. They say 10,000 steps per day doesn’t really do much for your health, but it keeps you from being too sedentary (which can be a real problem for me when I’m sitting at the computer all day). But if I said, “I will take 10,000 steps every day,” I would fail almost immediately. Instead, I’m going to try to average that amount so if I have a bad day or two, I can make up for it. That’s going to be a big change for me, because last year I only averaged 5,700 steps per day (according to my iPhone). So this one might be hard. Last year, I rode 455 miles on my bike — which was pretty good for my standards. But I only worked out a total of 33 days last year. That means I only exercised on 9 percent of the days! Clearly, that is not a healthy lifestyle (especially for someone who has high cholesterol like me). So I need to improve that, and in a hurry — or I won’t be here for as long as I hope. I’m going to shoot for 100 days working out this year (“working out” meaning a minimum of 20 minutes of exercise). Hopefully that will help my overall health. My biggest weakness in Year 1 of running my own site was failing to stay on top of things like replying to emails and DMs (I still have emails from last March that I’ve been meaning to return), staying organized with finances (tax season is going to be rough) and making improvements to the site/podcast/Patreon page. Obviously, the top priority is the editorial content (columns, interviews, news, etc.). But I just need to make more time for the rest of it — whether that means waking up an hour earlier or just using my time better. I have so many faults and flaws, and I need to work on becoming a better human overall. You can’t really ever stop when it comes to that. I need to make sure to recognize my shortcomings and try to fix them where possible. This one is pretty general, but there are too many specifics to tackle just one. So those are my five. What are yours? If you want to write yours down for accountability as well, feel free to post in the comments section below. I just wanted to keep you all in the loop on the latest developments with the website. It’s been going amazingly well and — if you can believe it — about a dozen different companies have reached out so far about the possibility of doing some sort of sponsorship. That’s really exciting in some ways, but so far I’ve been hesitant because I worry the people who have stepped up to fund my career (you!) might feel I am getting away from the mission of serving them if I accept advertising. But in the wake of getting a post-race podcast sponsor (SAM Tech, which many of you noted after Martinsville), I’m going to experiment with something on the website, and we’ll see how it goes. Dover International Speedway reached out and offered to throw some support to the site, and they’ve been super cool about it. I’ve talked to them on the phone a couple times since January, and they’re very enthusiastic and supportive about the whole JeffGluck.com thing in a similar way that many of you are. I decided to accept their offer, which means I’ll definitely be at both of their races. I also asked them to supply me with a custom ticket link, which means by using this link, you’re continuing to show your support for me and this site. So when you see a Dover banner ad on things like the 12 Questions in the next few weeks, that’s what that is. Anyway, I’d love to see you at the Dover tweetup if you can make it. And if you haven’t bought race tickets yet, here’s the handy link where you can do so. I’m interested in hearing your feedback about this. And as always, thanks for the support! So as you know, Dale Earnhardt Jr. started this whole JeffGluck.com hat thing — which, again, is not real! I don’t have hats! — with a couple tweets during Phoenix weekend. And while I still don’t have plans to sell any hats, Dale came up with a great idea recently that I hope will benefit a worthy charity. After a fan named @thetechdork made a JeffGluck.com hat and overnighted it to JR Motorsports, Dale reached out and suggested we auction it off for charity. The bidding started at $200 (if you can believe that!) and will last for a week; proceeds go to the Dale Jr. Foundation, which will then donate to Beads of Courage — my preferred charity. I’m SO happy Dale came up with a great way to use the hat prank craziness for a good cause. My wife, Sarah, is training to be a Child Life Specialist at a children’s hospital and has told me about how kids react to getting their Beads of Courage. If a child is getting a bead, they’re likely battling a very serious and chronic illness. For every needle poke, surgery or overnight stay in the hospital — just to name a few — the child receives a bead. I’ve been carrying some tire-shaped beads around with me since the Daytona 500 so a child will be able to say their bead was at the racetrack. Anyway, I hope the winning hat bidder knows they’re helping a worthy charity that makes a difference in the lives of children who are going through hard times. Here’s the link to the charity auction if you want to check it out. Thanks again to Dale for coming up with this idea (and by the way, the small print on the auction site says Dale “will autograph the hat if the highest bidder would like for it to be,” so there’s that!). Below are two videos: The Periscope where we announced the plan and a video where you can learn more about what Beads of Courage does. So there’s this hat thing going around (a hat movement!) where people seem to want JeffGluck.com-branded hats. It started as a sarcastic Dale Earnhardt Jr. tweet, and others joined in on the fun. He later continued the prank — a well-executed troll job, to be sure! I thought it was pretty hilarious. But now I’m getting a lot of tweets along the lines of: “Hey, that was funny, but we actually do want hats. When are the hats coming?” On top of that, no less than nine people (some very reputable!) have already reached out in the last 24 hours with offers to help me create and produce hats. That’s all very nice, and I’m certain many of you are serious that you would actually buy JeffGluck.com hats. Super cool of you to be so supportive! But here’s the thing: I don’t feel totally comfortable with selling hats. Or T-shirts. Or any merchandise, for that matter. Look, I’m absolutely THRILLED people are so pumped about my new adventure, and it’s going amazingly well so far. At the same time, though, I’m still a journalist covering your favorite sport; I’m not in the sport. As a media member, I’m supposed to be a go-between linking you with the drivers, so you can find out more information about them and get insight into their personalities. My job is to observe the show, not to be part of it. I know at times that line has been blurred — especially after the Las Vegas fight video put me in a brief spotlight — but the mission with this site remains a journalistic one more than a business one. I want to have fun with you while watching everything unfold together. So for now — and I say this despite much respect and appreciation for your wishes — there aren’t going to be any hats. I don’t want to rule out merchandise at some point in the future, but we’re only two months into this whole thing and I want to keep building the website/podcast in a respectable way — not cheapening it with JeffGluck.com coffee mugs and keychains. A lot of you might not have heard of Patreon until I started talking about it a couple weeks ago, so I wanted to share how I learned of the site in the first place. I’m a huge fan of the Survivor podcasts hosted by Rob Cesternino (his podcast is called “Rob Has A Podcast;” his website is RobHasAWebsite.com. Rob has this fun-loving tone to his work (which also extends to many other reality shows) and it’s clear he has a true passion and enthusiasm for what he does. His friendly nature also makes you feel like you could be buddies, which I love. Anyway, Rob sometimes mentions a link where listeners can go to “learn about the benefits of becoming a patron.” That piqued my curiosity last year, so I went to the site he mentioned: His Patreon page. I signed up for $5 a month — I get enjoyment from his podcasts and wanted to support them — and initially didn’t think much more about it. But when I found myself in a situation where I may need to change jobs, I started thinking about whether Patreon would work for supporting other kinds of journalism. But Rob wasn’t just the inspiration for my move. He actually took time to help me with it. I wrote Rob an email in early January and told him about my plan, thanking him for unknowingly introducing me to a potential new career path. To my surprise, he not only wrote back, but suggested we hop on the phone. A few days later, Rob took more than 30 minutes out of his day to help a complete stranger learn more about Patreon and talk through some of the pluses and minuses of the site. And before hanging up, Rob highly encouraged me to start a podcast in addition to just writing on this site. As a fan of Rob’s, it was a total thrill for me to get advice from someone who is doing it right in the digital world — and feel like I was on my own personal episode of RHAP at the same time. So I wanted to publicly thank him for all his help in getting me started. By the way, if you’re a Survivor fan and you don’t subscribe to Rob’s podcasts…what in the world are you doing? 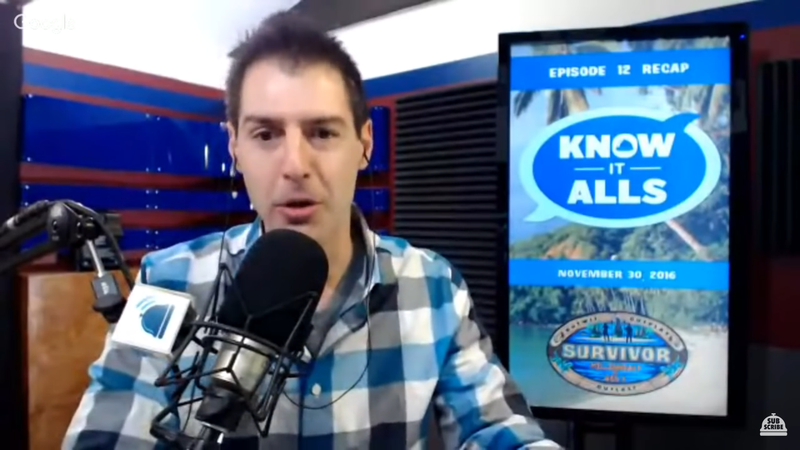 His weekly “Survivor Know It Alls” with Stephen Fishbach during the season are absolute must-listens for every Survivor fan (they immediately break down the strategy after the show) and his exit interviews with booted castaways following each vote always shed light on what really happened on the island. Seriously, I talk my friends’ ears off about what I learned each week on the podcast (ask poor Alan Cavanna). So listen to them; I promise you’ll be a more informed Survivor fan. Screenshot from one of RHAP’s Survivor Know It Alls episodes. Rob and Stephen live-stream the episodes on YouTube and then post them for podcast listening later.